Which kind of extinguisher should I use? This document was originally designed to focus on fire situations in chemistry laboratories. While it continues to mention laboratories, the information contained herein is broadly applicable to almost all workplaces. 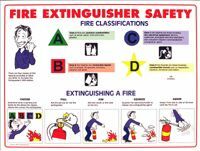 Get fire extinguisher training posters, and more at SafetyEmporium.com. You may have other "clean agent" extinguishers besides CO2 (see next section), particularly if your workplace has sensitive electronic devices such as computers. Those who work with flammable metals may also have a specialized Class D dry powder extinguisher for use on fires (in a pinch, a bucket of dry sand will do, but you really should have a Class D unit if you work with such materials). Water-filled extinguishers are not acceptable for chemistry laboratory use. If you have a water-filled extinguisher in your laboratory, have it replaced immediately by contacting your campus or corporate Fire Marshal's office. If you are not familiar with fire extinguishers and have not been trained in their use, DO NOT attempt to use them! If you work in a laboratory you should have received this training (it is usually a state or federal OSHA requirement); if not contact your supervisor immediately (TODAY....no kidding). Class D fires involve combustible metals, such as magnesium, titanium, potassium and sodium as well as pyrophoric organometallic reagents such as alkyllithiums, Grignards and diethylzinc. These materials burn at high temperatures and will react violently with water, air, and/or other chemicals. Handle with care!! Now available: Our on-line store, SafetyEmporium.com, carries all kinds of fire extinguishers including foam, Halotron and those hard-to-find Class D models. Everything from small hand-held units to large wheeled units and fixed distribution systems. If you need 1 extinguisher or 1,000 we can meet your needs! Some fires may be a combination of these! Your fire extinguishers should have ABC ratings on them. These ratings are determined under ANSI/UL Standard 711 and look something like "3-A:40-B:C". Higher numbers mean more firefighting power. In this example, the extinguisher has a good firefighting capacity for Class A, B and C fires. NFPA has a brief description of UL 711 if you want to know more. Water extinguishers (not pictured and not found in laboratories) are suitable for class A (paper, wood etc.) fires, but not for class B, C and D fires such as burning liquids, electrical fires or reactive metal fires. In these cases, the flames will be spread or the hazard made greater! Water mist extinguishers are suitable for class A and C; see below. Water extinguishers are effective on pool chemicals provided that they are correctly stored away from electrical hazards and equipment; see the blue box below for more on pool chemicals. Type BC fire extinguishers contain sodium or potassium bicarbonate. Type ABC fire extinguishers contain ammonium phosphate. When to use (or not use) Dry Chemical Extinguishers? Dry chemical extinguishers can be quite corrosive to metals such as aluminum and are also potentially abrasive. ABC extinguishers are much more corrosive than BC extinguishers because the ammonium phosphate agent can undergo hydrolysis to form phosphoric acid and because the molten agent flows into minute cracks. For this reason, dry chemical ABC extinguishers are not recommended for use on aircraft or electronics such as computers, MRI scanners, and scientific instruments. Boeing has stated in a service letter "Dry chemical extinguishers can cause extensive corrosion damage to airplane structure, electrical systems, and electronic equipment...Dry chemical fire extinguishers should only be used for airplane firefighting if there are no other extinguishers available and there is imminent danger to property or personnel." INCOMPATIBLES: ABC dry chemical extinguishing agents are incompatible with strong alkalis (bases), magnesium, strong oxidizers such as calcium hypochlorite (pool chlorine) and isocyanuric acids. BC dry chemical agents are incompatible with strong acids, lithium metal and sodium-potassium alloy (NaK), and monoammonium dihydrogen phosphate (also called "ammonium phosphate", NH4H2PO4). Mixing of fire fighting agents with incompatible materials can release toxic byproducts or pose other dangers. Alternative extinguishing agents should be used in areas where incompatible materials are likely to be used or encountered. For example, pool chemicals should be stored separate from other hazards and water extinguishers (see above) or carbon dioxide units should be provided. Proper planning can avoid situations where you might have to make a choice between extinguisher types. Ensure that the extinguishers closest to your aircraft, computers, and pool chemicals are of an approriate type (if local fire codes permit) and that workers in those areas are trained on when and how to use them. It takes effective training to recognize if your computer or airplane is fully engulfed in flames or a person is in danger, then possible added damage from an ABC extinguisher is moot, but using one on pool chemicals is likely to increase the peril. CO2 (carbon dioxide) extinguishers are for class B and C fires. They don't work very well on class A fires because the material usually reignites. CO2 extinguishers have an advantage over dry chemical in that they leave behind no harmful residue. That makes carbon dioxide (or Halotron I or FE-36; see below) a good choice for an electrical fire involving a computer or other delicate instrument. Note that CO2 is a bad choice for a flammable metal fires such as Grignard reagents, alkyllithiums and sodium metal because CO2 reacts with these materials. CO2 extinguishers are not approved for class D fires! To get an idea for what could happen, take a look at this General Chemistry demonstration page that includes a QuickTime movie of a magnesium metal fire contained inside a block of solid CO2! Carbon dioxide extinguishers do not have pressure gauges because carbon dioxide is a condensable gas. Thus, pressure does not tell you how much agent remains in the cylinder. Instead, the extinguisher should have a tare (empty) weight stamped on it. To determine the amount of carbon dioxide remaining in the extinguisher, subtract the tare weight from the current weight. Metal/Sand Extinguishers are for flammable metals (class D fires) and work by simply smothering the fire. The most common extinguishing agent in this class is sodium chloride, but there are a variety of other options. You should have an approved class D unit if you are working with flammable metals. The following types of class D extinguishing units are available through our on-line store, Safety Emporium. Sodium chloride (NaCl) works well for metal fires involving magnesium, sodium (spills and in depth), potassium, sodium/potassium alloys, uranium and powdered aluminum. Heat from the fire causes the agent to cake and form a crust that excludes air and dissipates heat. Powdered copper metal (Cu metal) is preferred for fires involving lithium and lithium alloys. Developed in conjunction with the U.S. Navy, it is the only known lithium fire fighting agent which will cling to a vertical surface thus making it the preferred agent on three dimensional and flowing fires. Graphite-based powders are also designed for use on lithium fires. This agent can also be effective on fires involving high-melting metals such as zirconium and titanium. Specially-designed sodium bicarbonate-based dry agents can suppress fires with most metal alkyls, pyrophoric liquids which ignite on contact with air, such as triethylaluminum, but do not rely on a standard BC extinguisher for this purpose. Sodium carbonate-based dry powders can be used with most Class D fires involving sodium, potassium or sodium/potassium alloys. This agent is recommended where stress corrosion of stainless steel must be kept to an absolute minimum. Halotron I extinguishers, like carbon dioxide units, are "clean agents" that leave no residue after discharge. Halotron I is less damaging to the Earth's ozone layer than Halon 1211 (which was banned by international agreements starting in 1994). This "clean agent" discharges as a liquid, has high visibility during dischage, does not cause thermal or static shock, leaves no residue and is non-conducting. These properties make it ideal for computer rooms, clean rooms, telecommunications equipment, and electronics. These superior properties of Halotron I come at a higher cost relative to carbon dioxide. FE-36TM (Hydrofluorocarbon-236fa or HFC-236fa) is another "clean agent" replacement for Halon 1211. This DuPont-manufactured substance is available commercially in Cleanguard® extinguishers. The FE-36 agent is less toxic than both Halon 1211 and Halotron I. In addition, FE-36 has zero ozone-depleting potential; FE-36 is not scheduled for phase-out wheras Halotron I production is slated to cease in 2015. A 100% non-magnetic CleanGuard model is now available (see the warning box below). Water mist extinguishers are ideal for Class A fires where a potential Class C hazard exists. Unlike an ordinary water extinguisher, the misting nozzle provides safety from electric shock and reduces scattering of burning materials. This is one of the best choices for protection of hospital environments, books, documents and clean room facilities. In non-magnetic versions, water mist extinguishers are the preferred choice for MRI or NMR facilities (see warning box below) or for deployment on mine sweepers. If you work around extremely high field magnets such as magnetic resonance imaging (MRI) machines or nuclear magnetic resonance spectrometers (NMR's), you should only have non-magnetic fire extinguishers on hand. The magnetic field of an MRI or NMR machine is strong enough to make a steel cylinder fly across the room with lethal force. Our on-line store, Safety Emporium, carries 100% non-magnetic Cleanguard and water mist extinguishers (picture, right) for use in MRI/NMR facilities. Check out the potential fire hazards in your area. Is there an extinguisher available? Do you know how to operate it? Are your extinguishers suitable for the fires you may encounter? If not, you'll want to contact your campus or corporate Fire Marshal's office. Typical small lab fires (in a hood or on a bench) can easily be controlled by a dry chemical (ABC) or CO2 extinguisher provided that you are properly trained. You are not required to fight a fire. Ever. If you have the slightest doubt about your control of the situation DO NOT FIGHT THE FIRE. Please see the Disclaimer below. Mark the location of all your extinguishers with our vinyl or aluminum signs (as low as $5 each; English or Spanish). Get them now at SafetyEmporium.com. The metal parts of CO2 extinguishers tend to get dangerously cold -- practice using one beforehand or have someone show you the proper way to hold one. Again, proper training is usually required by state or federal OSHA! Direct the extinguisher at the base of the flames until the fire is completely out. The pressure is at the recommended level. On extinguishers equipped with a gauge (such as that shown on the right) that means the needle should be in the green zone - not too high and not too low. The nozzle or other parts are not obstructed. There are no dents, leaks, rust, chemical deposits and other signs of abuse/wear. Wipe off any corrosive chemicals, oil, gunk etc. that may have landed on the extinguisher. Some manufacturers recommend shaking your dry chemical extinguishers once a month to prevent the powder from settling/packing. We are dubious this has any value (see this Ansul technical bulletin for a detailed discussion), but you are going to pick it up to inspect it anyway, so why not give it a good shake? Learn more about Bourdon gauges at Safety Emporium. If the extinguisher is damaged or needs recharging, get it replaced immediately! One more time: Recharge all extinguishers immediately after use regardless of how much they were used. fire_safety.pdf - the full awareness and extinguisher training (768 K, PDF). fire_extinguisher.ppt - the fire extinguisher training component only (1.23 Mb, PowerPoint). extinguisher_truck.ppt - Extinguisher training for waste trucks (1.26 Mb, PowerPoint). checklist.doc - Handy sheet for posting next to extinguishers (49 kB, MS Word). safety_exam.doc - Short handout quiz to follow training (49 kB, MS Word). sign_in.doc - A training sign-in sheet for your record keeping convenience (22 kB, MS Word). If you can't find the file on your computer after downloading, use the Find feature of your computer operating system to search for the file name(s) listed above. The National Fire Protection Association (NFPA) issues a number of other life and fire-safety standards. You can view (but not copy, paste, print, or save) copies of these from the NFPA web site. 29 CFR 1910.106 - Flammable and combustible liquids. 29 CFR 1910.156 - Fire brigades. 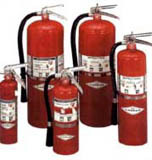 29 CFR 1910.157 - Portable Fire Extinguishers. 29 CFR 1910.158 - Stand pipe and hose systems. 29 CFR 1910.159 - Automatic sprinkler systems. 29 CFR 1910.160 - Fixed extinguishing systems, general. 29 CFR 1910.161 - Fixed extinguishing systems, dry chemical. 29 CFR 1910.162 - Fixed extinguishing systems, gaseous agent. 29 CFR 1910.163 - Fixed extinguishing systems, water spray and foam. 29 CFR 1910.164 - Fire detection systems. 29 CFR 1910.165 - Employee alarm systems. University of California at Irvine, 2001 - Fire injures 3 and destroys a laboratory. University of Kentucky, 1997 - Includes impressive photographs and lots of additional safety tips. University of Texas at Austin, 1996 Bad lab practices lead to a six-alarm lab fire, over $300,000 in direct damages, and $24 million+ in renovations. SUNY Canton Laboratory Fire, 2012, closed the campus for a whole week! Our retail store, Safety Emporium carries a wide range of extinguishers, signs, labels, cabinets, covers and more. Disclaimer: This page contains guidelines for the use of fire extinguishers and is not meant to be a comprehensive reference. There are many circumstances that these guidelines can not foresee and you should recognize the inherent danger in relying solely on this information! If you would like to take a course on the proper use of fire extinguishers (including some hands-on training) your campus or corporate Fire Marshal's office may be able to assist you. If not, try your local fire department's non-emergency phone number for more information. This web page was last updated Sunday, June 12, 2016 and is copyright 1995-2019 by Rob Toreki. Send questions and comments to our Support Team. All rights reserved.